Nothing gets me more in the mood for the holidays than Sharon Sahl’s polymer clay gingerbread houses. She made only 10 for sale this year and there are just a couple left. Click on the large versions of her photos to see how detailed these beauties are. “I buy and measure candies and cookies and gum and make them 1/4 sized with whatever clays best match their opacity. Trees are built from green star shapes, baked and then layered with white clay icing. For the cookies, I make an original with as much detail as I can fit onto a 1/2 inch disc, make a mold, and then pull every cookie from that mold. Gumdrops are coated with very fine glass beads and really look like gumdrops,” Sharon explains. Her “Christmas Kids” ornaments are created with equal attention to detail. Sharon has moved back to Ohio and we’re happy she’s returned. 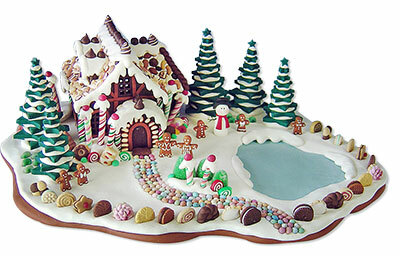 I love the gingerbread houses, I’ve been using glass bead “sugar”on gum drops for years, they really do look real. Sharon’s work is fantastic! Hey everyone — it really is worth your time to visit the site and click on the rest of the gingerbread houses. 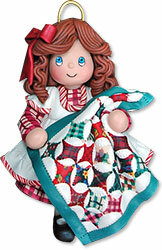 They are fabulous, and tickle the part of the imagination that loves the magic of whimsy and charm. Then you can get lost in the rest of the site and be as impressed as I am with Sharon’s meticulous craftsmanship. Thank you, Sharon, for such a delightful start to my day. Cynthia, thank you for your kind mention of the gingerbread houses and the links. I just got a call from a customer who said she found me here, so came to check. And thank you, all the rest of you, for your much appreciated comments. Can you PLEASE call me!! I have a quick near and dear to my heart story I would like to share with you and also in need of a new figurine!! You can email me and I will text you my phone number since I am not sure how these posts appear private or public. I used to come to your home for open house!! What a beautiful way to make a gingerbread house! My daughter and I used to make one every year and then we would have to throw it away. Maybe we’ll give this a try. But these houses are masterpieces! This is the kind to have, not the sugary variety, the joy will last a lot longer with these, although I see they are already all sold out, and I can see why, these are delightful! It’s beautiful and so charming! How fabulous is that! I love the cookie fence! It would be fun to scent the clay with clove and cinnamon oil to give it even more realism! @Patricia Kramer – where can i buy the glass beads for gumdrop sugar? What ever happened to Sahl. Your link to her is not working. Does she still do the Christmas houses? I love this clay gingerbread house and was wondering do you sell them at all? Nope, Sharon is no longer working in polymer.